Oh, hey, everybody! Look over here! The New Kids on the Block are BACK and better than ever! Look at them dance! Listen to them sing! Smile and nod at their television interviews about how they are all grown up now and ready for that big comeback! I can't lie. I was never into the New Kids on the Block. Oh, I tried to be into them. I bought a huge poster of Joey McIntyre and hung it on the wall behind my door. And I would pretend I was totally in love with him. Believe me, I wanted to make out with that poster like I meant it. But all I really felt was friendship and a cold, cold wall. On more than one occasion, I picked up a cassette of NKOTB's music and walked around the store like I was planning to buy it. But then I would always put it back, unsure if it was worth my entire $10 allowance. So, to this day, I have never actually heard a New Kids on the Block song in its entirety. I can, however, sing from memory most 1970s Tanya Tucker songs. Not that I would have ever admitted that when I was in sixth grade when NKOTB were at the height of their popularity. Have I mentioned that I used to be a huge phony? The same thing applied when Beverly Hills 90210 gained popularity. We didn't have Fox, so I never watched it. But that didn't stop me from fawning over pictures of Luke Perry in 'Teen magazine and reading interviews wherein Shannen Doherty revealed that she loved U2. It's sad, really. I had always suspected that I was a bit weird because of the way people reacted when I talked about my dream where my dead cat came back as an angel. Or when I showed up at school wearing giant pink sparkly squid earrings. But it never really occurred to me to try to tone it down a little until I got my secret Santa gift in 6th grade. It was a copy of 'Teen magazine. At first, I was flattered that someone wanted to give me some new reading material. But it occurred to me later that maybe I was getting subtle eyebrow plucking advice. And so, I heeded the pages of my new magazine and began to slowly and methodically put away my childhood. I painted the pink walls of my bedroom over with white. I threw away my unicorn posters. I stopped letting my mom do my hair. And I pretended to enjoy the New Kids on the Block. Because that's what girls my age did back then. What? Oh, like you never do it. Shut up. I think I'm just a few years too young to have been involved in the NKOTB and 90210 crazes. Or too culturally unaware/sheltered. Or maybe a bit of both. But I did (still do) emulate people and worry about not fitting in. Everyone does. Fashion could not survive without it. Do you still have those sparkly pink squid earrings? Because they sound kind of awesome. I feel like I was able to keep up until sometime around 2002, and then pop culture just drifted from me entirely. I watched 2 minutes of a Gossip Girl episode and had to turn it off because I didn't want my death certificate to have "Cause of Death: Gossip Girl Bewilderment" written on it. I am actually afraid to post this because I think ineffable.me won't be my friend anymore if I don't like Gossip Girl. OMFG! @sf - When Gossip Girl premiered, I couldn't get through the first episode. Then I found myself reading the recaps at Television W/out Pity and started watching when it was in reruns during the writers' strike. And now I'm hooked... And a week behind, since I have class on Mondays when the new ones air. Grr. I have lost all context I had about popular music at this point. I don't listen to the radio, and I don't even have my college DJ job to tell me what the new indie stuff is anymore. doesn't the news ruin the taste of tea? @Jen: You did not miss much, believe me. Nope, I think I threw them away at some point, but trust that they were awesome. @sigourney: I lost my interest in pop culture around the same time. I finished college and focused on other stuff. And then when I looked around again, I was several years behind. I'm also not a huge fan of the Gossip Girl show. Every time I catch a moment of it, I notice something vastly different from the books, and as I've mentioned, that drives me batty. I love the books. They are pointlessly hilarious and addictive. If I watch the news, I drink a tea that suits it. Like that laxative tea. OMG, their HAIR! 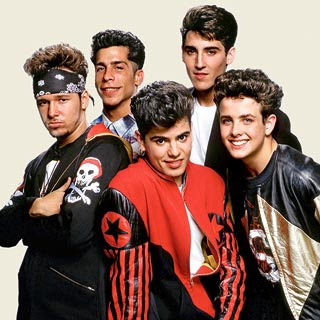 I'd forgotten how big the NKOTB boys' hair was back in the day!!! Ah, memories. Pass the AquaNet. Thankfully, then my older brother took me under his wing and taught me all about R.E.M. And thereby saved me from several more potential years of tweendom. @msdirector: I avoided my brother's taste in all things unfortunately. He had semi-good taste in music, but I wasn't interested back in the day. He was all Nirvana, and I was still all ROXETTE. Roxette is eternal! Do not diss Roxette!!! My roommates and I may or may not have a choreographed dance to "Listen to Your Heart." We may or may not blast that song at all our parties. I once had a drunken choregraphed routine to "Love Child" with one of my roommates. It was hilare. You guys, Conor is STILL all about Roxette. His pop culture radar is all messed up because he spent most of the early 90's in Europe. He is delightfully out of touch on things and will blast "Dangerous" in the car at any given moment. @msdirector: The front's bad enough, but remember the back? Rat tails!!! @sigourney: Uh. I think I like Conor because that is all kinds of awesome. @bgc: Ohmygod, I didn't even remember that either. God they were ridiculous. @sf: The first night my roommate and I drove up to our new apartment to start loading in our stuff, we were blasting "It Must've Been Love." I'm sure our neighbors LOVED us. badenBaden and i were the only girls in the entire 5th grade that did not like NKOTB. You are one step closer to being the identicle triplet! Didn't one of them wear glasses, at least when they were just starting out? I had their first album on cassette. I alternated listening to that with Leonard Bernstein conducting the New York Philharmonic in The Nutcracker. Guess which one was the fad. @t.c. : That is a question only you can answer, guy. I used to make out with my NKOTB pillowcase. @fitforafemme: I really need hotter pillowcases. Stripes just aren't doing it for me these days.